The State Government changed the penalties for exceeding the speed limit on 1 September 2012. Speeding increases the risk and severity of crashes and reducing speeding will save lives and injuries on our roads. The expiation fee for the lowest offence reduced from $260 to $155 and demerit points doubled from 1 to 2. Higher demerits and expiation fees for higher level offences. What happens if you exceed the speed limit? You have to pay the expiation fee or go to court and you'll incur demerit points. The more demerit points you accumulate, the greater the risk that you could lose your licence. accumulate 12 or more demerit points in any three year period. accumulate four or more demerit points or commit any speeding offence of 10 km/h or more over the speed limit on a Learner'e Permit or Provisional Licence. accumulate two or more demerit points on a Probationary Licence or while on Good Behaviour Conditions. How will sticking to the speed limit save lives? The risk of a casualty crash approximately doubles with each 5 km/h increase in speed on a 60 km/h road or with each 10 km/h increase in speed on a rural road. A reduction of 5 km/h in average travel speed would reduce deaths and serious injuries on rural roads by about 30% and urban crashes by about 25%. What has changed with these new penalties? 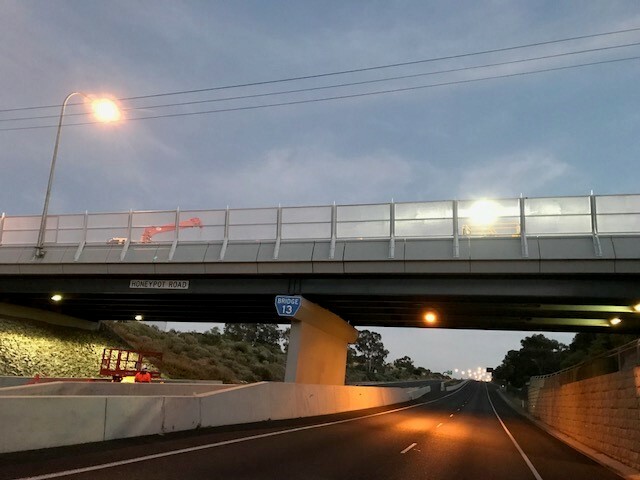 Speeding offence brackets changed from 15 km/h to 10 km/h increments for offences up to 30 km/h over the limit, creating an extra offence bracket. The lowest level offence changed from exceeding the speed limit ‘by less than 15 km/h’ to ‘by less than 10km/h’ recognising that travelling at 14 km/h over the speed limit poses a greater risk than travelling at 8 or 9 km/h over the limit. The expiation fee for exceeding the speed limit by less than 10km/h reduced from $260 to $155 and demerit points doubled from 1 to 2. Exceeding the speed limit by 10km/h but less than 15km/h – the expiation fee increased from $260 to $340 and demerit points tripled from 1 to 3. Exceeding the speed limit by 20km/h but less than 30km/h – the expiation fee increased from $383 to $690 and demerit points increased from 3 to 5. 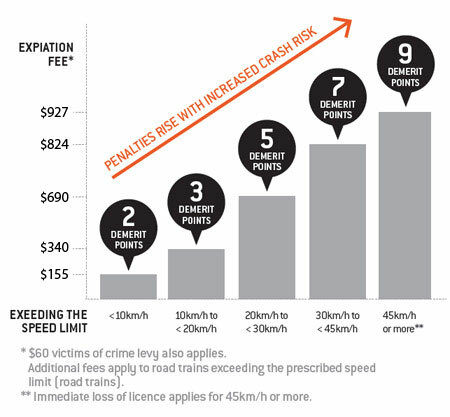 Exceeding the speed limit by 45km/h or more – the expiation fee increased from $671 to $927, demerit points increased from 6 to 9 and immediate loss of licence continues to apply. Higher court imposed maximum penalties for some speeding offences. When did the new penalties commence? The new penalties apply to any speeding offence committed on or after 1 September 2012. Why did the Government change speeding penalties? Penalties are a critical part of the mix of speed limit enforcement necessary to save lives and reduce injuries on our roads. The number of speeding offenders has reduced in recent years with a declining road toll but almost a quarter of motorists still exceed the speed limit. The new penalties better match the safety risk and are likely to be a greater deterrent because of the risk of losing your licence from the accumulation of demerit points. Why introduce another offence bracket? Crash risk doubles with each 5km/h increase in speed on a 60km/h road or each 10km/h increase in speed on a 110 km/h road. Introducing 10km/h increments better reflects the relationship between increasing speed and crash risk. For example: From 1 September, those who speed by 10 km/h but less than 15 km/h over the speed limit will incur a higher penalty because of the increased risk. Why did the expiation fee reduce for the lowest offence? Speed enforcement is aimed at changing driver behaviour, not raising revenue. The lower expiation fee more closely aligns with penalties in other jurisdictions and combined with an increase in demerit points aims to more effectively deter repeat offenders. Why have demerit points increased for low level speeding? Drivers who can afford to pay expiation fees are more likely to be deterred by the possibility that the accumulation of demerit points will lead to a loss of licence. The greatest reduction in casualty crashes will come from reducing low level speeding. The Centre for Automotive Safety Research estimates that nearly 60% of the benefit of eliminating speeding could be achieved by eliminating speeding among those travelling up to 15 km/h over the limit. What are the higher court imposed maximum penalties that will apply? Court imposed maximum penalties will increase from $2,500 to $5,000 for speeding offences under the Australian Road Rules and for road trains exceeding either the prescribed speed limit (road trains) of the 40 km/h speed limit in a built-up area in Orroroo, Peterborough, Port Augusta or Whyalla. How do these penalties apply to road trains? The higher expiation fee for speeding road trains recognises that the crash risk is even higher when these heavy vehicles speed. This is because the greater vehicle mass generates more vehicle momentum which increases the distance it takes to stop the vehicle in order to avoid a crash. What happens to all the speeding fines collected? Apart from the $60 Victims of Crime Levy, all revenue from anti-speeding devices is returned to road safety through the Community Road Safety Fund, which has allocated $602 million to reducing fatalities and serious injuries on our roads since it was established on 1 July 2003. New speeding penalties is just one of the ways we're working to save lives and injuries on South Australia's roads. Safe system principles are used to integrate with other methods of intervention including improvements to road infrastructure, driver behaviour and vehicle technology.